In today’s digital world, the network is critical — if the packets don’t move, users and customers suffer, and the revenue doesn’t flow. But it is also one of the most valuable, untapped information assets in the company. Yet while networks and datacenters are radically different than 20 years ago, the tools to manage and mine them for critical operational and business intelligence are not. 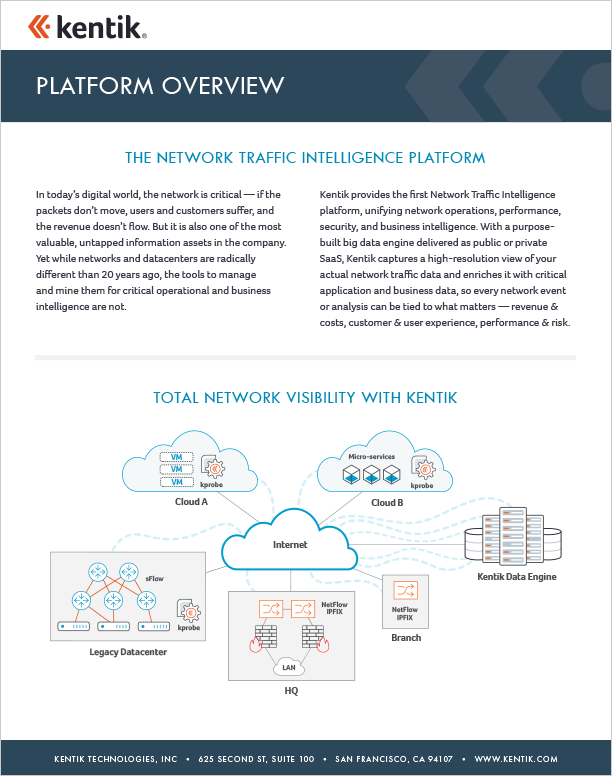 Kentik provides the first Network Traffic Intelligence platform, unifying network operations, performance, security, and business intelligence. With a purposebuilt big data engine delivered as public or private SaaS, Kentik captures a high-resolution view of your actual network traffic data and enriches it with critical application and business data, so every network event or analysis can be tied to what matters — revenue & costs, customer & user experience, performance & risk.